The Sandy boys basketball team put on a big finish to score a 66-51 win over Hood River Valley in a 5A qualifier game Wednesday night. The home crowd was getting nervous when Hood River's Carson Flores came off the bench and knocked down 3-pointers on successive trips down the floor to put the visiting Eagles up 43-40 early in the fourth quarter. Sandy head coach Jason Maki called a timeout. "The thing with high school kids is that the emotions get going and they tend to forget things," Maki said. "The scouting report says he's a shooter, and I just had to remind them of that. We came back out and did a better job staying focused on him. Instead of reacting once he had the ball, we were tracking around the court when he didn't have the ball." Flores scored one more bucket, and Hood River managed only eight more points in the fourth quarter. 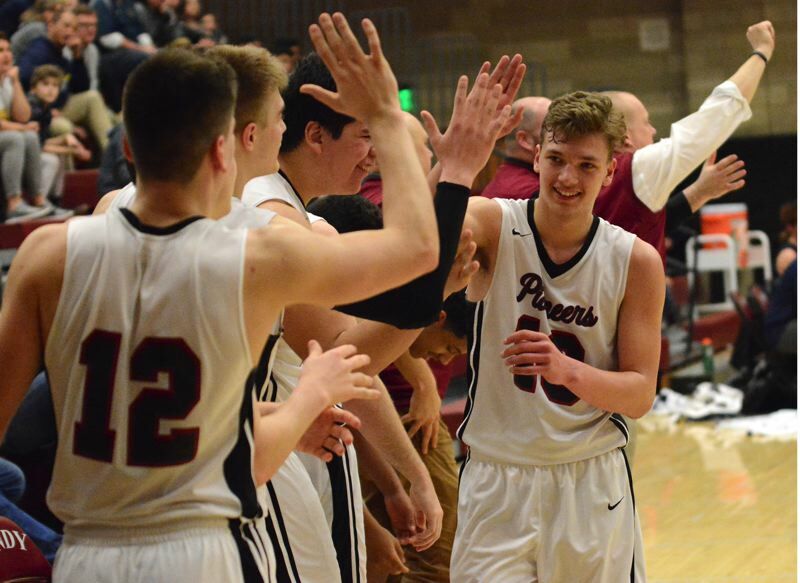 Meanwhile, the Pioneers exploded for 28 points in the fourth, pulling in front to stay when Pierce Roeder tracked down a loose ball, dribbled behind his back to avoid a defender near mid court and fired a pass ahead to Colby Carson for a layup. Back-to-back 3s by Kaleb Hubbard and Wyatt Fisher put Sandy in charge 55-45 with 3:16 to play. The Pioneers closed out the victory by going 11-for-12 (.917) at the free-throw line over the final two minutes. Roeder hit six straight during the key stretch of 1-and-1 opportunities and finished with a game-high 33 points. Sandy (10-14) advances to play at No. 1 Silverton (22-1) in the first round of the 5A playoffs at 7 p.m. Saturday. The Silver Foxes beat Sandy 82-44 in mid-December. "They aren't going to be scared of us, but I know we've improved a lot and we'll come in loose with nothing to lose," Maki said. Look for expanded qualifier-game coverage ahead in our March 7, print edition.